Makensie Jones '18 and Isabel Figueroa '19 (first row, first and second from left, respectively) pose after their presentation with fellow presenters and their professor, Maria Bruno (back row, second from left). From the cultural clues embedded in centuries-old vessels to the secrets swirling around a World War II prison site, there are stories waiting to be uncovered in everyday objects and spaces. Students in Dickinson archaeology classes are on the case, and three of them recently presented original research at an international conference that was organized by an archaeology department alumna. 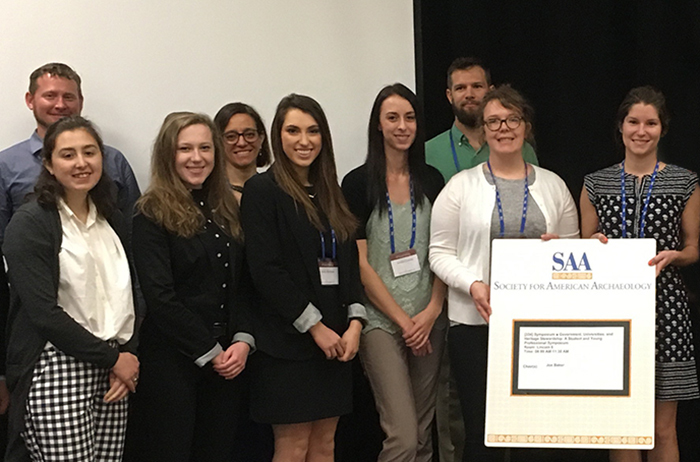 The students attended the 2018 Society for American Archaeology (SAA) Annual Meeting, an event that brought more than 3,000 professionals together in Washington, D.C., April 11-15 for poster sessions, forums and symposia. While in D.C., Makensie Jones ’18 (archaeology, anthropology) and Isabel Figueroa ’19 (archaeology, art & art history) shared their investigations into Cumberland County’s Camp Michaux, and Allison Curley ’19 (earth sciences) discussed a student-faculty research project on Peruvian drinking vessels that included a field research trip out West with Assistant Professor of Earth Sciences Alyson Thibodeau. The conference was coordinated by Solai Sanchez ’15, an SAA employee and former Dana Research Assistant who conducted student-faculty research with Assistant Professor of Archaeology Maria Bruno as an undergrad archaeology major. Jones and Figueroa performed their research last spring, as part of Bruno’s Archaeological Methods class, a required course for archaeology majors. After learning basic research methods, such as aerial survey, test pit excavation and feature mapping, they each developed a research question focusing on one of the five major periods in Camp Michaux’s storied history. A short drive from Dickinson’s campus, Camp Michaux was a family farm in the 1700s, an iron-ore site in the early 1900s, the site of a Civilian Conservation Corps camp in the 1930s and a prisoner-of-war interrogation camp during World War II, housing both German and Japanese prisoners. From 1947 to 1972, it was home to a church camp. Figueroa focused on the 1700s Bunker Hill Farm period and investigated the role of women on the farm at that time. Jones studied the treatment of German and Japanese soldiers at the POW camp. The students then conducted a literature review, walking survey, test pit excavation, feature recording, and processed and analyzed their findings. Allison Curley '19 marked her second professional conference this spring when she shared student-faculty research at the SAA. Curley began working with Thibodeau last spring, while taking Archaeological Geology, their second course together. Thibodeau was collaborating with Emily Kaplan, a conservator at the Smithsonian’s National Museum of the American Indian, to analyze the geochemistry of white pigments applied to colonial-era qeros (sometimes spelled "keros" or "queros"), Andean ritual drinking vessels that have been used in the Andes for millennia during rituals expressing reciprocal political, social and religious relationships. She invited Curley to work on the project; the goal was to analyze the isotopic signatures of lead white pigments applied to the vessels’ surfaces, investigate the source(s) of the pigment and determine whether Andean artisans used lead ores from different deposits at different points in the colonial era to manufacture it. After researching the subject and developing a database of the isotopic signatures of lead deposits recorded in geological and archaeological literature, Curley took a summer trip with Thibodeau to the University of Arizona. There, she analyzed minute scrapings of pigments from the surfaces of the centuries-old vessels and then used specialized equipment to get precise isotopic characterizations of each sample. Next came data processing and analysis. The student-faculty team identified trends, cross-referenced their samples with Curley's source data and interpreted their results. They're now working with collaborators on a paper announcing their findings, which they’ll submit to a peer-reviewed journal. When the time arrived for the students to present their work, the students found themselves in esteemed company. Figueroa and Jones were the only undergraduate presenters in their group, and Curley was the only nonprofessional in hers. “There are few undergraduate archaeology programs in the United States overall, let alone one where sophomores and juniors are able to conduct their own research and present at a national conference,” added Jones, who has tapped those experiences to secure a job with the National Park Service.